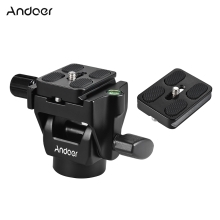 Andoer M-12 monopod tilt head support ±90° quick tilt movement. It has quick release plate and the package sent with another two. Designed for monopod, support ±90° tilt movement. Quick release plate with 1/4" screw; Sent with extra 2pcs quick release plates. Bottom diameter 38mm, with 3/8" thread. Heavy duty aluminum alloy construction, can support up to 10kg load. With bubble level for quick balance. Bottom Diameter: 38mm / 1.5"
Quick Release Plate: 50 * 38mm / 2 * 1.5"
Package Size: 10.5 * 9.7 * 9.5cm / 4.1 * 3.8 * 3.7"
Only the monopod head is included.